Your Doctor’s Report is included with your initial visit. 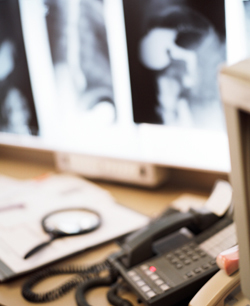 Once we have had an opportunity to assess and correlate your health history, examination findings, and the results of your scans and spinal images we will be able to determine the best course of action for your care. This is your longest and most important visit to the office, plan for approximately 90 minutes. There are two parts to your report. The Doctor’s Report starts with an explanation of how your body works, how it heals, and what causes interference to this process. We will show you what a normal spine looks like and how the spine degenerates. We will also explain strategies to get you on the road to healing. We will continue with showing you your individual exam results and specific recommendations for your care. You will want to get started with your care right away and will have the opportunity to receive your first chiropractic adjustment right away; this will be the first visit in your plan and is subject to the regular office fee. When you decide you want to start care we will discuss the best health savings plan for you. Since the majority of patients come in with their whole family, we have created a variety of optional savings plan choices and family plans to make your care affordable for you and your family. Our regular visits are designed to fit into your busy day. Read on to find out more.